Listening skills are so important! Before you can effectively teach procedures and academic skills, your students need to listen and attend to what you are saying. 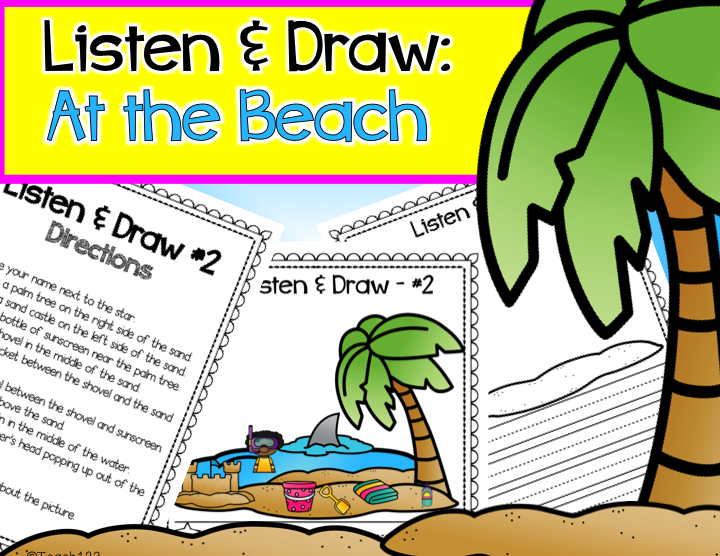 Summer themed listening skills activities called “Listen and Draw” are included in this latest edition. I recommend doing this as a teacher directed activity in the beginning. You may want to introduce this in a small group setting if your class has a wide range of abilities. You can give different groups different expectations for the writing assignment portion of the activity. There is an extra writing page included for your students who are ready to write a paragraph or story about the picture. Once your students are comfortable with the format, you can record the directions or ask a parent volunteer to do it for you. Or ask the drama department at your local middle school or high school if there is a student who is interested in doing this for you. Students are often looking for community service opportunities. After each step, either pause to give students time to do the work or use some type of noise maker like a bell or xylophone. Tell your students to push the “stop” button when he/she hears the sound. Push the “go” button after he/she follows the directions and is ready for the next step. This can be used many different ways. 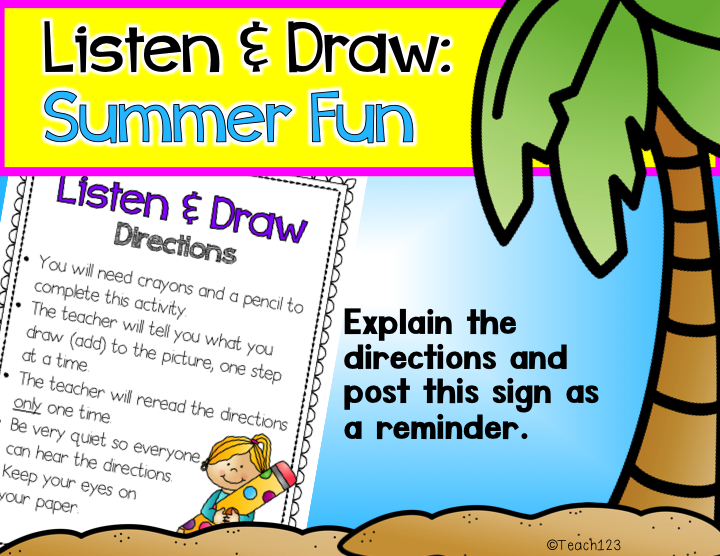 WRITING CENTER: Record the directions and set it up as a center. EMERGENCY SUB PLANS: Great activity for your sub. R.T.I. DOCUMENTATION: Great way to show proof of listening skills growth over time for R.T.I. 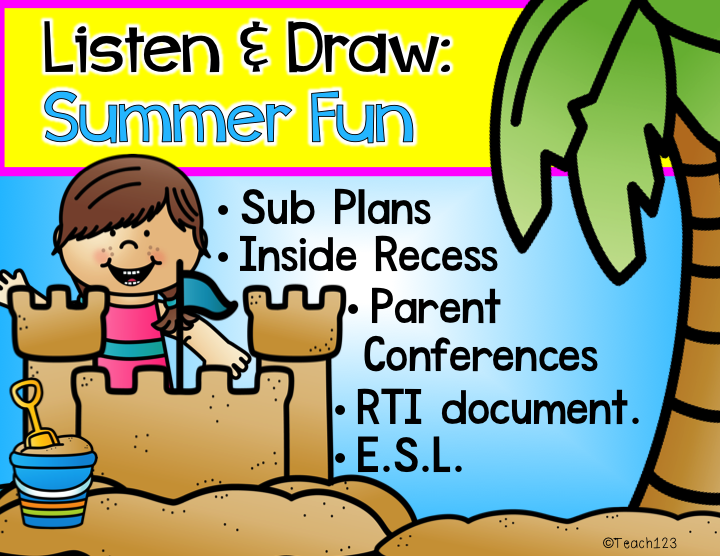 INSIDE RECESS – FRIDAY FUN DAY: Students will love the art part of these activities. 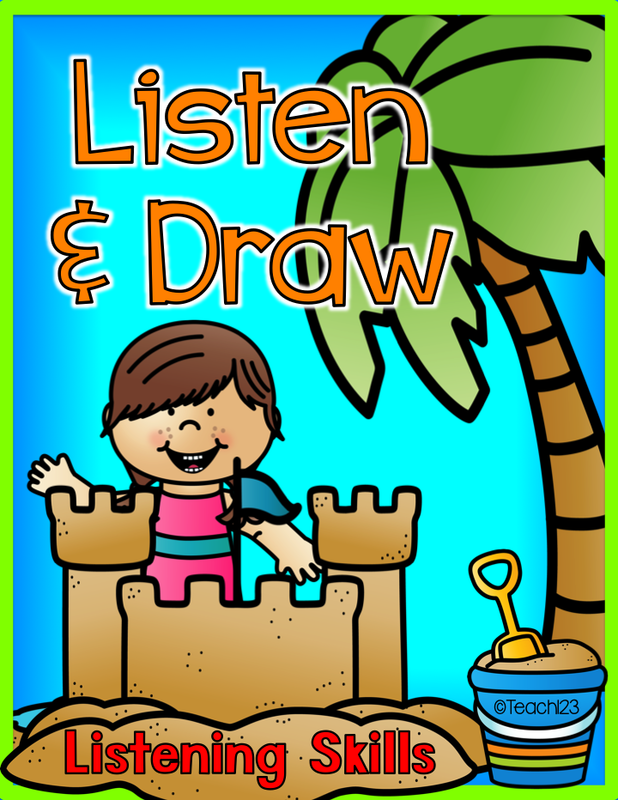 You will love the fact that your students are quiet so they can listen to the directions. E.S.L. / E.L.L. : E.S.L. / E.L.L. teachers have left some very nice feedback. They said it worked great with their students. Great way to teach prepositions, too! Go over the directions and then hang the sign in the graphic above as a reminder. -Colorful page showing what the art portion of the listening activity could look like. Art work answers may vary. 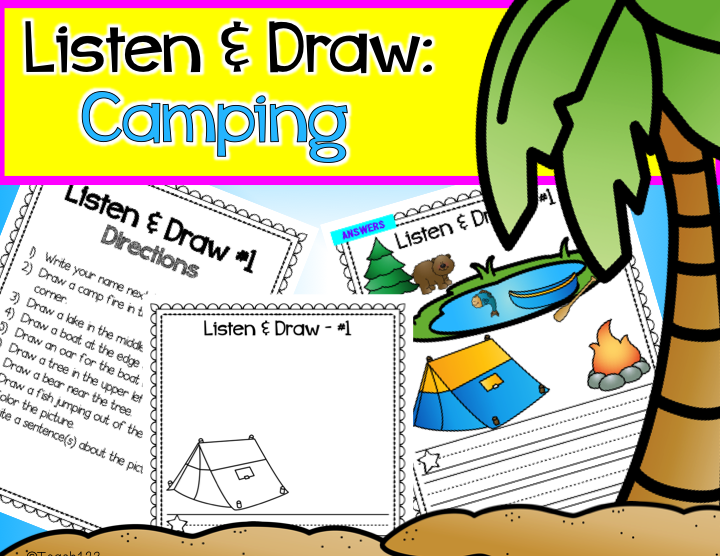 This camping theme listening activity would be a great extension when teaching -ing or a camping themed unit. Do you teach an ocean unit at the end of the year or in summer school? Use this activity to extend your unit. 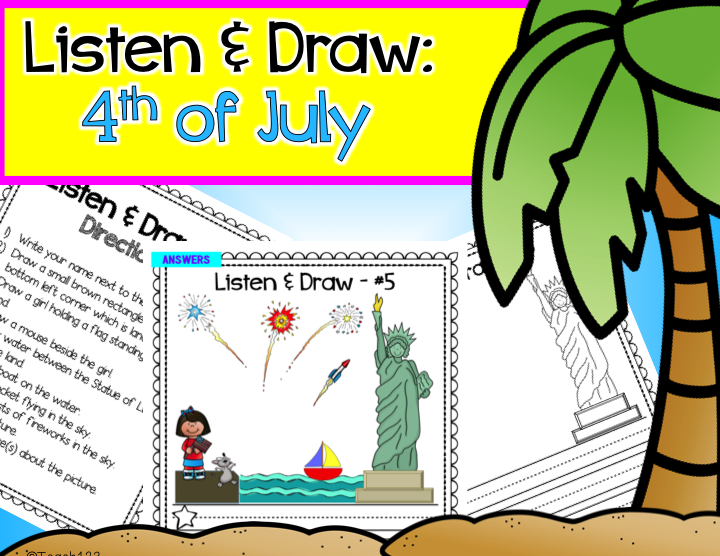 This listening activity can be used as a 4th of July lesson or an extension for American symbols or landmarks unit. Click HERE if you’d like to see more. Would you like to try a FREE sample? Click on the picture below. I have other Listen and Draw packets. « Ocean Sub Plans: A Home for Hermit Crab & More!